The inauguration of the German unit was held on 26-27-28 June. MB S.p.A. is a company based near Vicenza, and it leads the world in the manufacture and marketing of jaw crusher buckets whose design and manufacture are entirely located in Italy, reflecting clear company policy in this regard. Its expansion is continuing with the opening of a new office in Germany. The German market, which right from the start has provided important results for the company led by managing director Guido Azzolin, from today has direct access to the Italian manufacturer’s products and services. MB S.p.A. took the decision to undertake this challenging development, fully conscious of the characteristics of the German market, where success requires determination, quality products and quality services: factors that have long been a hallmark of the Vicenza-based company. Commitment to total quality, the constant improvement in results, and a company mission that privileges total client satisfaction: these are the values that MB has pursued since its foundation, and that have now laid the foundations for the new unit in Baden-Württemberg. The German office will place the efficiency and specialization of the Italian team directly at the services of purchasers abroad, by means of a highly functional after-sales service, which has always been one of the company’s points of strength. 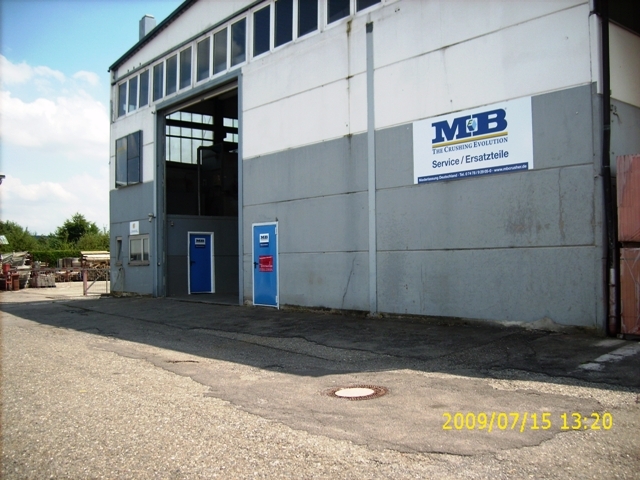 MB Deutschland was in fact founded with the objective of providing increasingly comprehensive assistance and technical service to clients in Germany, while also offering a local warehouse facility capable of meeting all product requirements. The company’s policy is to be at the service of its clients at all times, and so at the German branch, just as in Italy, customers can see the jaw crusher buckets in action, providing an immediate demonstration of the products' functions and advanced technology. Clients can arrange demonstrations of each jaw crusher bucket model, according to their individual requirements, simply by contacting Michael Sancarlo, branch manager. The question of distance is not something that worries managing director Guido Azzolin. During the inauguration of the branch, he said, “Today, technology and advanced communications are the only feasible direction for operating efficiently in the world of business, and we have exploited all this, concentrating particularly on “just in time” technology, both in client management and in reporting. “The opening of the German branch,” continued Azzolin, “was an exciting event. Many guests were present, and we saw first-hand just how much enthusiasm the opening of this unit has instilled both into our consolidated clients, and equally into our potential new customers. It is still too early to speak of excellent results, but the initial response justifies hopes of great success for MB. In opening our branch in Germany, we adopted an approach of great discretion, but with the determination fuelled by the awareness of being a company offering a winning product, and by the fact that there are excellent prospects for great success. Our local presence represents a powerful message for all those who have been asking precisely for this development.” This branch is just the first step in MB’s expansion outside the Italian borders. Though products built by the company based in Breganze, near Vicenza, are already familiar and distributed in other countries, both in Europe and in America, there are already further prospects in the pipeline for the formation of new operational units. France is the most likely candidate for the next international branch. The technical and functional breakthrough intrinsic in MB’s products, the result of an idea dating to as recently as 2001, has once again proved to be a winning factor, hallmarking a process of research and development conducted by an expert, highly qualified team. The result is that the company’s products have reached levels of excellence that have won it international recognition, leading to sales that have now reached Euro 20,500,000.